A fun DIY kit for the 6 to 106 year old crowd! 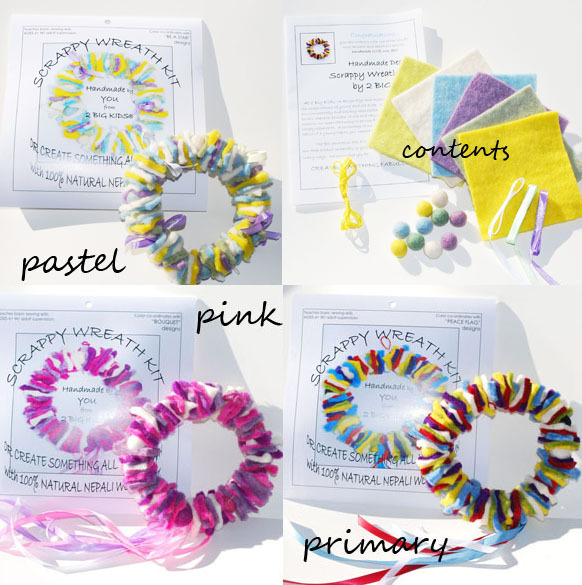 This scrappy wreath kit comes with 120 sq inches of handmade wool felt, 1 meter heavy duty embroidery thread, 10 handmade felt beads and 2 1/2 yards of silk/satin ribbon. Also included is a simple instruction and idea booklet. What you need...scissors a needle and creativity! Makes wreath approx. 5-6" in diameter. The felt in this kit has been rescued from the overage pile when making out other products, so that nothing goes to waste! We work with a small family owned business in Nepal where felt has been made for generations. A portion of our profits support local aid for chilren. For ages 6 and up. Not for children under 3.